BookBaby, online at bookbaby.com, is the online resource for all the things you need to publish your book. BookBaby offers publishing packages and helps writers sell their ebooks worldwide to be read on any device, including Kindle, iPad, Nook, Sony Reader, and more. Plus, BookBaby takes 0% of ebook sales, ensuring authors get 100%. BookBaby also offers other services like book cover design, printing, websites, editing services, and more. So get your work out there, and be sure to save with all the latest bookbaby.com discounts, BookBaby promotions, and BookBaby coupon codes found here at RetailSteal.com. Shop at BookBaby and enjoy $200 savings on order of 100+ printed books. Click here for code. Enjoy $200 savings from BookBaby.com today when you purchase 100 printed books. Use this coupon code to start saving. Hurry over to BookBaby today and use our coupon code online to save $50 on your purchase. Shop at BookBaby and enjoy 20% savings on ebook cover design. Click here for code. Shop at BookBaby and enjoy 10% savings on all orders. Click here for code. Save 10% when you publish your novel at BookBaby.com. Click link to activate savings. Save 10% on memoir publishing from BookBaby. Click link to enjoy savings. 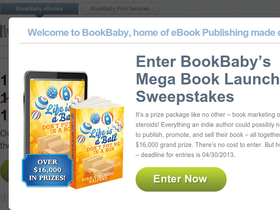 Get an ebook publishing package for free from BookBaby. Click here and enjoy offer with the purchase of 100 or more printed books.